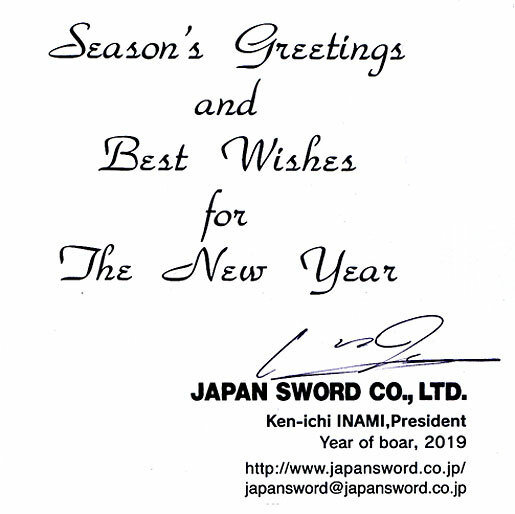 We will be closed from August 13th (Sun.) 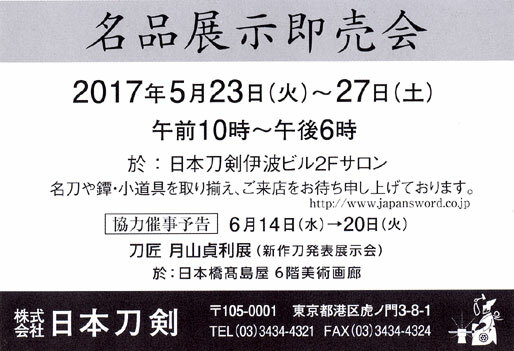 to 18th (Fri.) of 2017 for the traditional summer holiday. 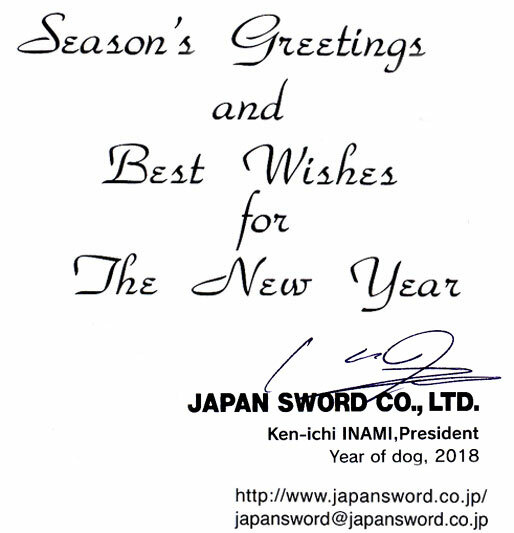 is well-known swordsmith of Kaga (=Ka-shu, now Ishikawa pref.). 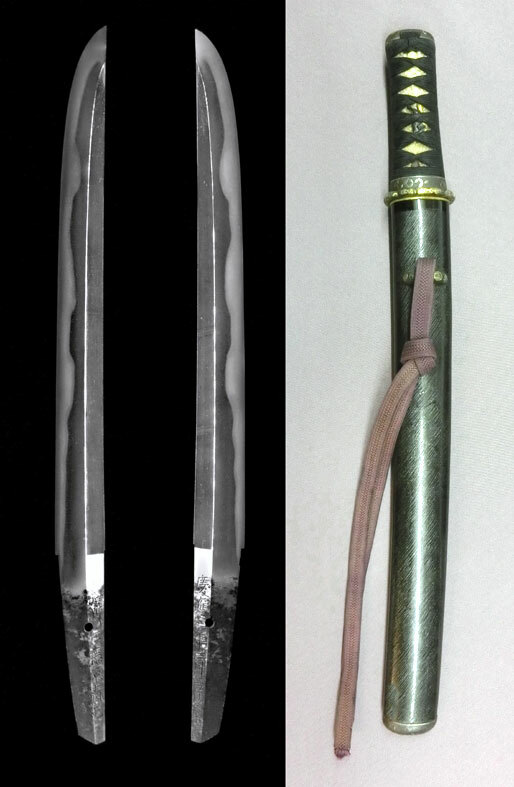 lacquered scabbard mounting must be preferred by upper-class Samurai. 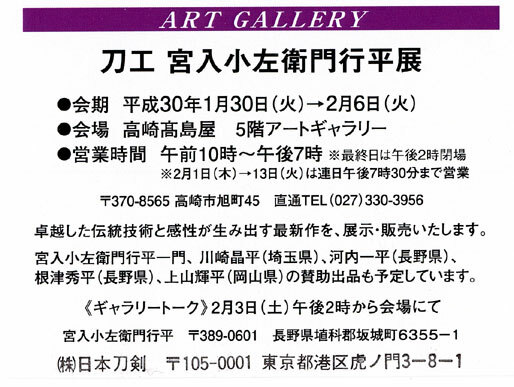 Now on sale at our gallery. Endo Eiji (1906 - ?) who is a pupil of Moritsugu Norisada in 1924, became an army commission sword smith after independence. Kurume city in Fukuoka prefecture. 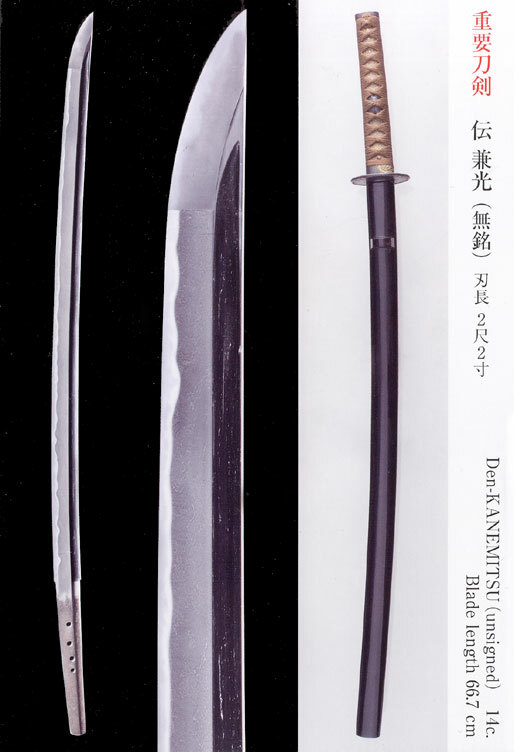 His real name is Enomoto Eishichiro who was born in 1954.
who is one of prominent pupils of Gassan Sadakatsu. Shizuoka Pref. 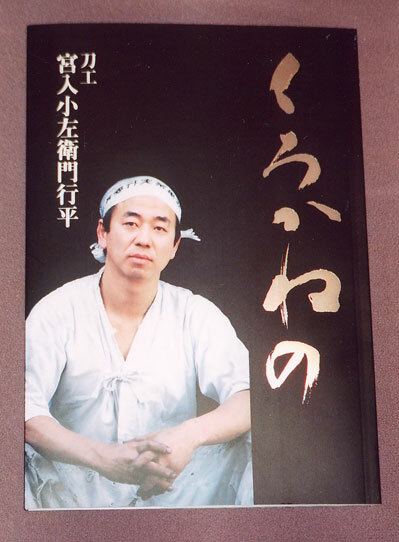 Kawahara SADACHIKA (real name is Kawahara Shin-ichi) was born in 1968.He became a pupil of Gassan Sadaichi who is the Living National Treasure.Shiga prefecture. 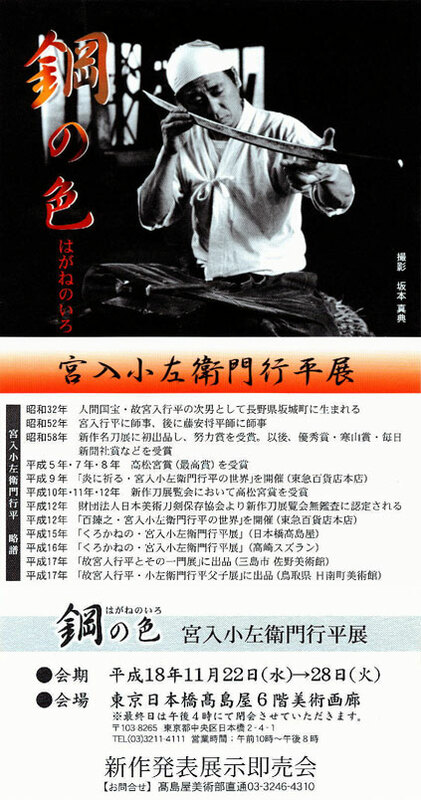 He was born in 1946 as a son of Living National Treasure “Gassan Sadakazu”. Working at Sakurai city in Nara Pref. 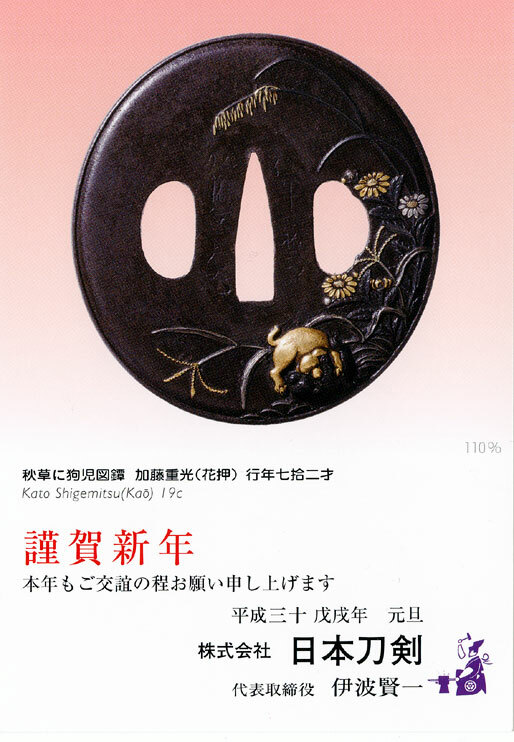 The holder of Important Intangible Cultural Property in Nara. 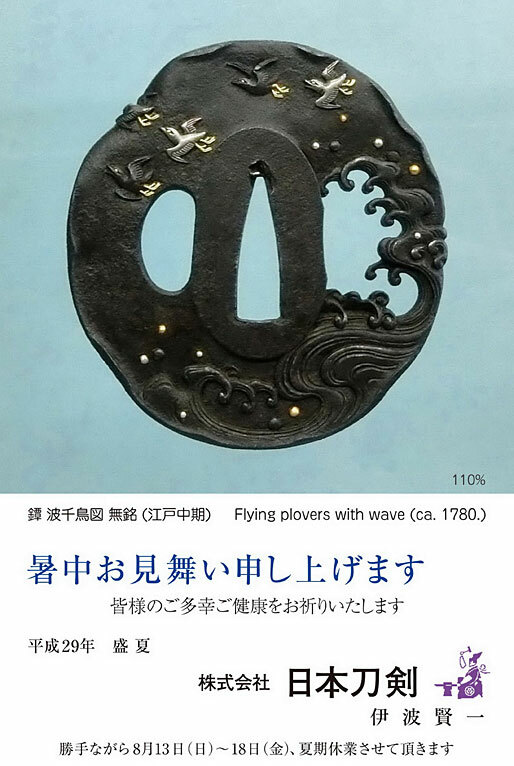 Enju Nobushige was active in Kumamoto prefecture. owned as a lucky charm. 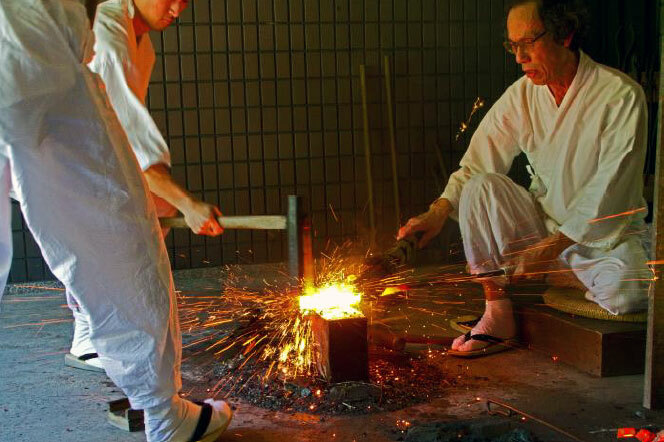 He became a pupil of Kobayashi Yasuhiro in 1972, and established own sword smithy at Tsuyama of Okayama prefecture in 1981. 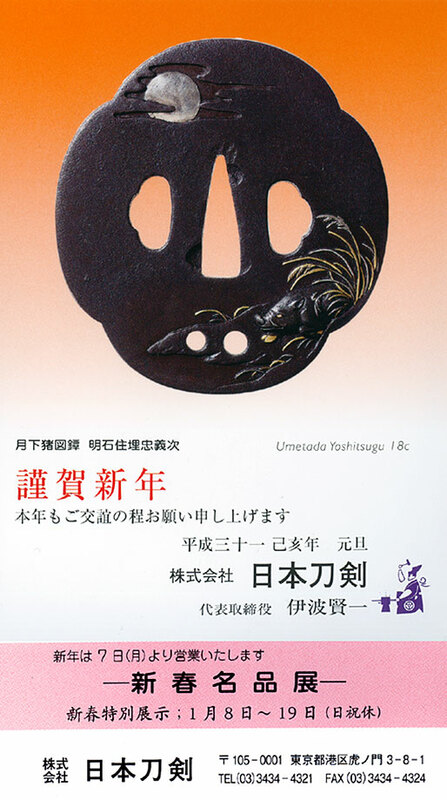 The holder of Important Intangible Cultural Property in Okayama (1997). 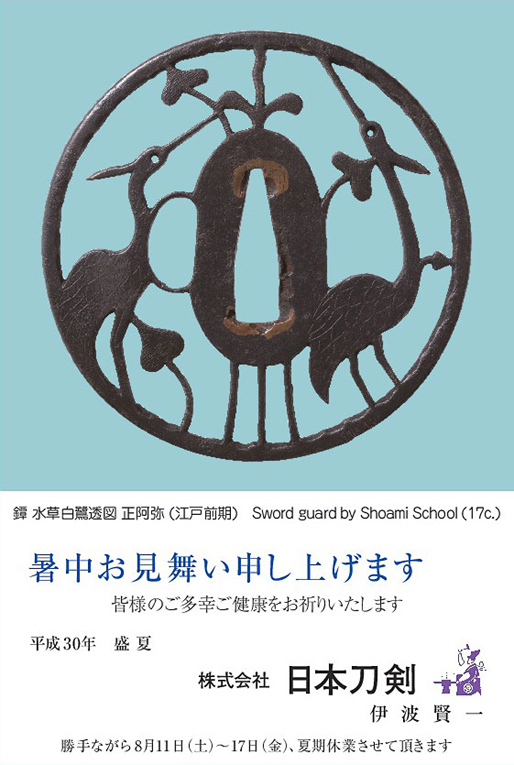 Miyairi Akihira (later Yukihira, 1913-1977) who was born at Sakaki in Nagano, joined the Nihonto Tanren Denshu-jo at Akasaka in Tokyo (Japanese Sword Forging Institute which is founded by Kurihara Hikosaburo.) in 1937. 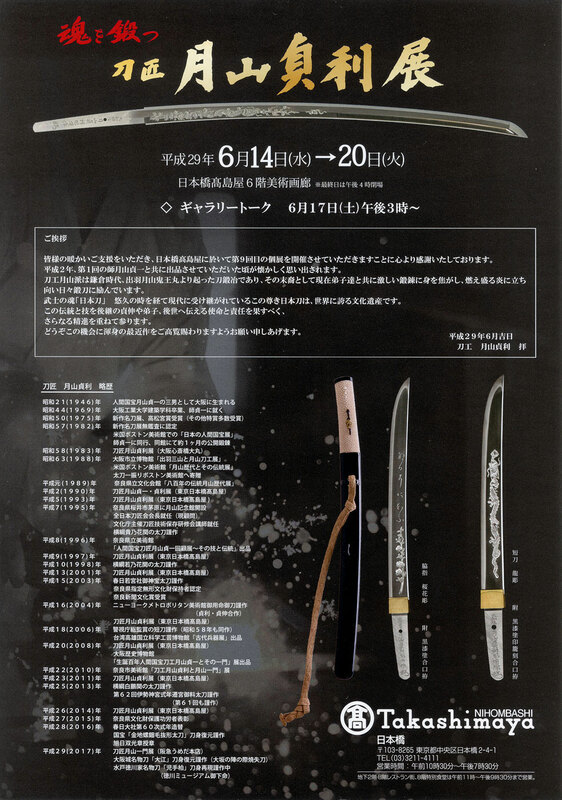 Since then he received many awards and also offer of making sword for dedication from the Grand Shrine of Ise. 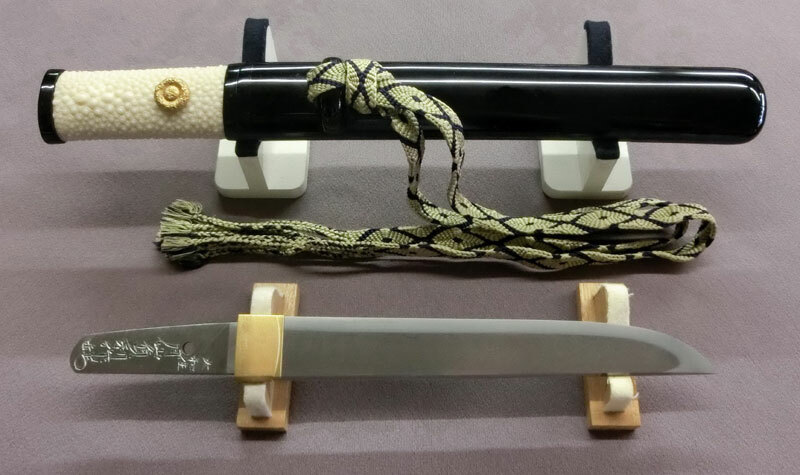 And designated as the Living National Treasure(Ningen kokuho)in1963.It is inscribed on the blade tang that this is made with the sameTamahagane carbon steel as the Tanto of Royal Princess Hitachiwhich was made in 1964. Hozon certificate paper by NBTHK. 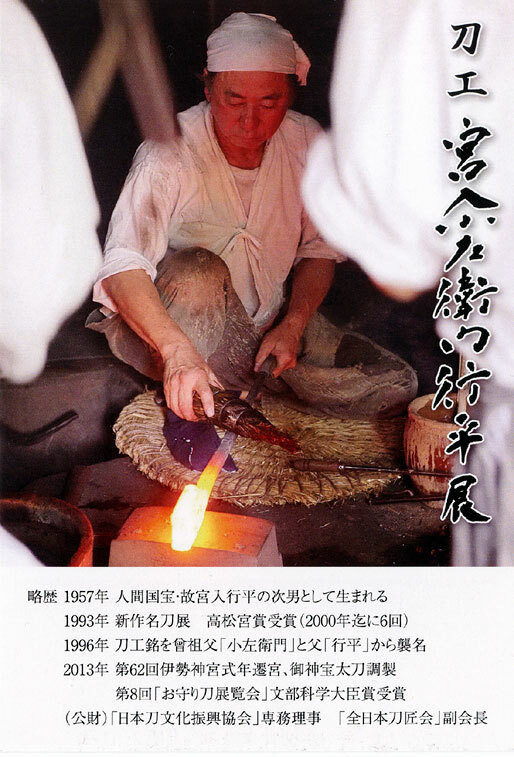 He was born in 1946 as a son of Living National Treasure “Gassan Sadakazu”. Sakurai city in Nara pref. 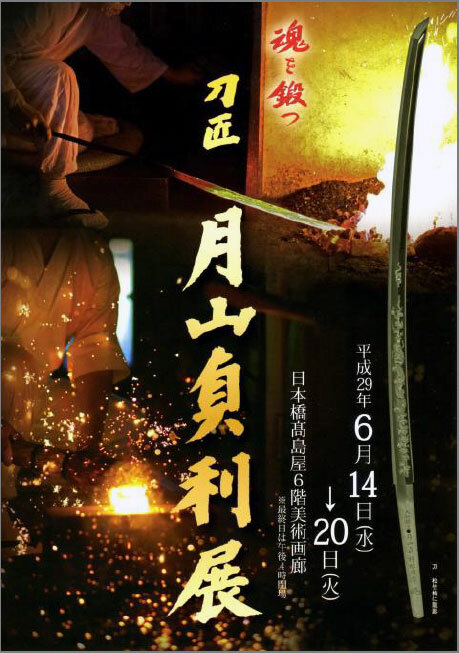 The holder of Important Intangible Cultural Property in Nara. 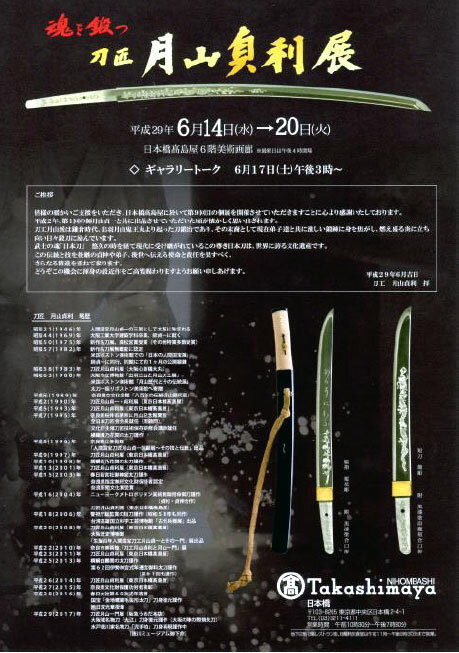 with a straight sword engraving, blade length 37.3 cm (JP\2,625,000). NY to him is also shown during this exhibition then going there to display.